Next Tuesday, you’ll probably eat lunch. And thanks to programs like the National School Lunch Program, most of America’s kids will be able to eat lunch too. More than 20 million U.S. kids receive a free or reduced-price school lunch every day. But only a fraction of those enrolled in a lunch program receive a nutritious breakfast each morning. And far too many of those kids have to worry about where their next meal is coming from when they’re not in school. You can do something about this by taking part in Share Our Strength’s Bag Childhood Hunger Day on November 1. No matter where you plan to have lunch on November 1, we hope you’ll take a stand against hunger by donating the cost of your lunch that day. Every dollar donated can help Share Our Strength connect a hungry child with up to 10 meals. A donation that’s equal to your $10 lunch will go a long way to help hungry children. It’s critical for us to get as many people on board as possible on November 1 — the more who donate the cost of their lunch that day, the more children we can connect with food where they live, learn and play. 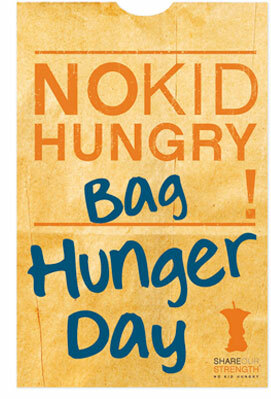 Tell us you’re “in” and then help spread the word about Bag Childhood Hunger Day.